A woman sang a creepy lullaby offering love to the baby she aborted at an event blessing an abortion clinic, according to a video uploaded to YouTube Tuesday. “I knew it was from the spirit of that child, saying it’s OK [to have an abortion],” the woman added. The slogan “Faithfully Pro-Choice” can be seen on the podium at which she stood. The video was published by Created Equal, a pro-life group dedicated to the battle for equality. “Who knows how long I’ve loved you? You know I love you still. I will wait a lonely lifetime, if you want me to I will — love you forever and forever,” the woman sang. She ended by telling the crowd that she thought it was a blessing from the child telling her it was OK to have the abortion. 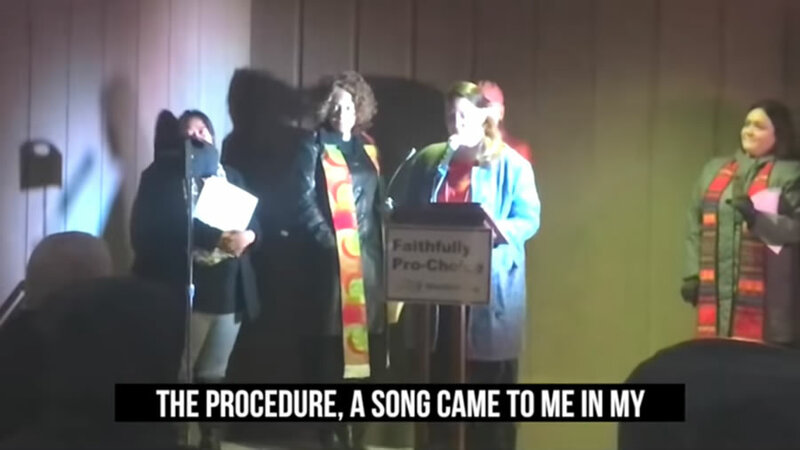 The woman sang the lullaby at a blessing of Your Choice Healthcare abortion clinic in Columbus, Ohio, according to a tweet from Created Equal. The clinic sits on the northeast side of Columbus and opened on July 9. It was sued not even two weeks after it opened for violating its lease agreement as well as its non-compete contract. The clinic’s homepage features dozens of pills filled with glitter and stars with the words, “Yes, we have abortion pills.” The clinic offers medication abortions up to nine weeks and six days, according to its website. The facility does not offer surgical abortions. The abortion pill costs roughly $300 to $800 depending on the state and the woman’s health care plan. The abortion pill costs $525 at the Columbus clinic, according to its website. The abortion pill is 98 percent effective for women less than eight weeks pregnant and 96 percent effective for women eight to nine weeks pregnant. The abortion pill is 91 to 93 percent effective for women who are between nine and 10 weeks in pregnancy, Planned Parenthood reported. The clinic hopes to expand its operations to include surgical abortions. Satan is having a “field day” with the Reprobates. I love you, yet I’m going to murder you. Hmmm….that is demonic, completely insane, beyond this person’s ability to comprehend….all of the above! Why do we say aborted when we mean killed? “…the baby she aborted….” To intentionally abort (terminate) a pregnancy (induced abortion) the human being must be killed. She sang a lullaby to the baby she paid someone to kill. Sadly, this is just another example of a woman deceiving herself despite the facts being right in front of her.